HP PremierFlex cables are the addition to the HP fiber optic cable family, offering significantly better bend performance and signal-transmission integrity than existing OM3 and OM2 technologies. Uses bendable fiber technology reduced downtime, troubleshooting, and operation expense OM3+ (3000 MHz-km), multi-mode completely compatible with all OM2 and OM3 installations. 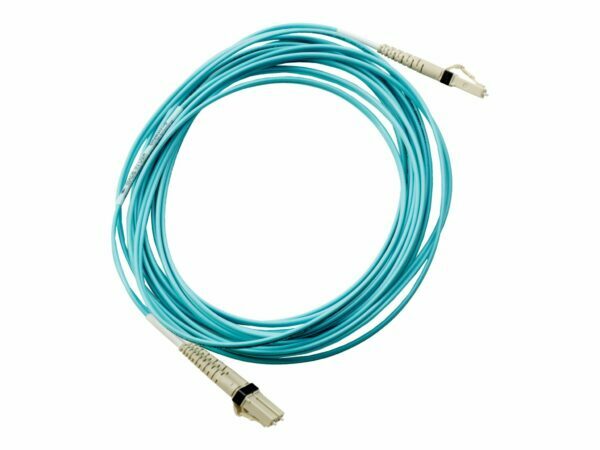 The HPE PremierFlex 3.3 ft network cable have 112% better signal quality than standard OM2/OM3 fiber cables. The HPE PremierFlex 3.3 ft network cable is Less susceptible to signal loss in typical routing applications, which means more up-time, less troubleshooting, and lower operating expense. The HPE PremierFlex 3.3 ft network cable with simplified installation it can be handled more intuitively. It is 135% higher bandwidth and less modal dispersion than standard OM3 cables, and 840% higher bandwidth vs. standard OM2 cables. Provide signal reliability and peace of mind.